Carl Funtal has spent most of his adult life as a tough guy, protecting the public as a sergeant with the Shaler Township Police Department. Truth be told, he’s really kind of a softie. Despite his commanding appearance — at 6 feet, 3 inches (6-4 in his motorcycle boots) and 275 pounds, he dwarves most folks — the Pittsburgh native isn’t afraid to admit he likes to . . . cook. He’s particularly good at making the comfort food of his youth that speaks to his Polish-Russian-Czech-Austrian heritage, and the one that he’ll dish up this weekend at South Shore Riverfront Park during the city’s newest food fest: Pierogies. As a kid growing up in Brookline, Mr. Funtal watched as his mother, Laura, rolled out and then cut big hunks of soft dough into circles to be stuffed with mashed potatoes and cheese. He doesn’t recall helping out too often, but somehow, maybe through osmosis, he learned. By the time he married and started raising children, he’d garnered such a reputation for his exquisite potato dumplings among family and friends (the dumplings often were included on the party spreads he catered during off-duty hours) that one day, someone told him he should be making them professionally. Then again, maybe making a few batches here and there and selling them as a fundraiser might be a fun way to help cover the cost of his daughters’ dance lessons. Last year, that paternal labor of love evolved into Cop Out Pierogies, a small storefront on Butler Street in Etna (copoutpierogies.com; 412-973-0068). For $6.75, you can buy a cop’s dozen (14) traditional potato-and-cheese pierogies, or you can spend a little more for one of the specialty flavors, which run the gamut from Buffalo Chicken to Spring Roll to Cheeseburger to sweet Lekvar, a thick Eastern European jam made from prunes. Or maybe you’d like to try the more seasonal Pilgrim Pierogie, a plump conglomeration of turkey, potato, corn and fresh cranberries. He’ll have an ample supply of those Thanksgiving-style dumplings, too, at Saturday’s first-ever Pittsburgh Pierogi Festival. The brainchild of Riverlife Pittsburgh and the Urban Redevelopment Authority, the free fest will feature nearly a dozen pierogie vendors and/or restaurants along with live entertainment and children’s activities. There also will be a pop-up pierogie market selling everything from pierogie T-shirts and onesies to jewelry, crocheted ornaments and all sorts of other swag; and attendees can snap photos with the likes of Sauerkraut Saul and Cheese Chester. It was the latter who logged the most wins this year at PNC Park (22) running the Pirates’ signature 280-yard Pierogi Race at home games. The fest runs from noon to 5 p.m., rain or shine. Chocolate “Pie-Rogie” from Cop Out Pierogies in Etna. Post-Gazette photo. All proceeds will benefit the recently completed South Shore Riverfront Park (riverlifepgh.org), the $13-million, 3.4-acre park in front of Hofbrauhaus Pittsburgh that will play host to the event and that extends the SouthSide Works retail complex down to the Monongahela River. Activities will take place near the terraced, 1,000-seat outdoor amphitheater. He’s not kidding. In addition to Mr. Funtal, scheduled vendors include the Polish Pierogi Truck, which will be serving at least three varieties; S&D Polish Deli in the Strip District; Kevin Sousa of Salt of the Earth, who will trot out a family recipe; and Marty’s Market, which will offer a sweet-potato pierogie. If you’re from Pittsburgh, where pierogies are among the city’s most celebrated foods, no doubt you’re saying: It’s about time! After all, we’ve got festivals for just about every other ethnic edible imaginable on any given weekend throughout the area. You’d be right. All signs point to the inaugural event being a runaway hit. Close to 500 people already have RSVP’d on the festival’s Facebook page, which leads organizers to expect upwards of 1,000 or more. Traditionalists might consider Mr. Funtal’s new-fangled flavors sacrilege, and it’s hard to blame them. Generations of Pittsburghers have grown up on pierogies lovingly hand rolled, filled and folded by church ladies at parishes such as Saint Mary Ukrainian Orthodox Church in McKees Rocks, Saints Peter & Paul Ukrainian Catholic Church in Ambridge and St. George’s Ukrainian Catholic Church in Brighton Heights. Many more pray at the altar of Pierogies Plus, the down-to-earth McKees Rocks shop in a not-so-converted gas station that’s been cranking out the tasty dough pockets in the Polish tradition for more than 20 years. A media darling, the Island Avenue store has been featured on The Food Network and in national magazines such as Saveur, which in 2011 included it on its annual list of 100 great food finds. Gosia’s Pierogies in Latrobe, which uses a “secret” recipe handed down from the owner’s grandmother in Poland, also has a devout following, as does Szmidt’s Old World Deli in Greenfield (and soon to be in Garfield) and S & D Polish Deli in the Strip District, where 15 varieties are made with Polish flour. If a survey of the Pittsburgh restaurant scene is any indication, you no longer have to be of Slavic origin to make a good dumpling. Nor do you have to stick to the traditional fillings of potato-and-cheddar or cottage cheese. Pierogies have become a popular ingredient among a growing number of Pittsburgh chefs, who have been using them to spice up everything from hamburgers to steaks to the dessert menu. Church Brew Works, for instance, recently had both rattlesnake and alligator pierogies on its menu, and Eleven tops its prime beef ribeye with a dumpling stuffed with pastrami. Braddock’s offers pierogies ranging from Braised Short Rib to Buffalo Chicken to Chocolate and Peanut Butter. At Franktuary, you can get your dog “Pittsburgh” style, or topped with a smooshed pierogie and slaw, and a fried pierogie also is a topping option at Burghers in Harmony. Knossos Gyros in Dormont has (what else!) pierogies filled with lamb carved off the cone and tzatziki sauce. And at Rowdy’s BBQ and Fatheads, they’re deep-fried to a golden brown as an appetizer. Pierogies also have joined Pittsburgh’s expanding food-truck scene via Polish Pierogi’s Pittsburgh Pierogi Truck. Before they ceased operation late this summer, the duo behind Peddlin’ Pierogies sold gourmet pierogies made with organic spelt flour from the back of a bicycle, as well as at Inn Termission Lounge on the South Side. Their non-traditional flavors included Buffalo Blue Cheese and Curry-Sweet Potato. 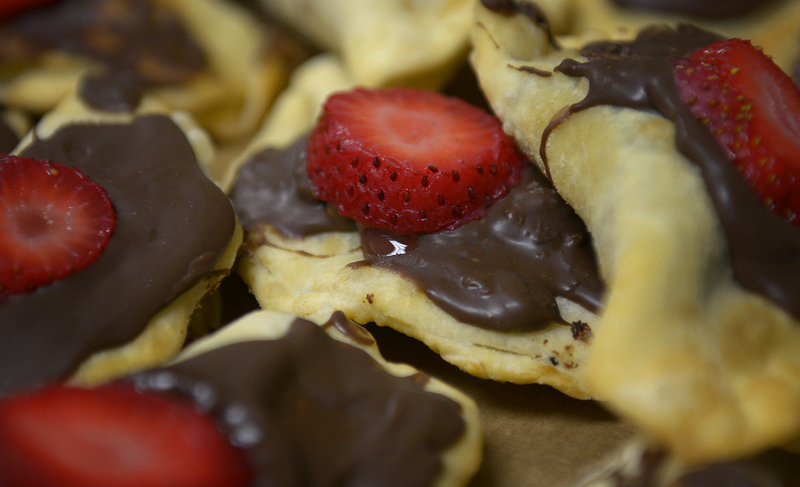 Speaking of preparations and flavors your Polish babcia might never had considered, Downtown’s Sinful Sweets occasionally includes a chocolate-dipped pierogie on its menu. And Mr. Funtal, who will open a small sit-down space in front of his commercial pierogie kitchen in about a month, offers more than 10 different Pie-Rogies, or dessert pierogies. This time of year, Pumpkin Spice and Apple Maple Walnut Cheese Cake are among the more popular varieties, but he also sells a heck of a lot of Banana Split and Freaking Fudge pierogies. And kids, says his wife, Beth, who works part time in store with their 16-year-old daughter, Sydney, love their PB&J dumplings. “They can’t get enough of them,” she says. Despite being something of a newbie, Cop Out Pierogies already has proven it’s got some chops: Not only does it supply more than a half-dozen restaurants including Atria’s with pierogies, but it also grabbed the No. 2 spot this June on Pittsburgh Magazine’s 2013 Best Restaurant Reader’s Poll, when it had been in business for only nine months. Mr. Funtal now makes between 300 and 500 dozen a week with help from his family when he’s not busy keeping Shaler safe. (He mixes, rolls and cuts the 30-pound chunks of dough into circles while his wife and daughter fill the dumplings.) He plans on doing an open house on Nov. 23. He credits much of his success to his dough, which includes sour cream and is cut by hand using a metal milkshake cup. The result is a pierogie that’s not quite like a snowflake, but obviously not one of those mass produced, 12-to-a-pound pierogies, either. “People like that,” he says. “A consistent taste but slightly different texture” with each bite. But Pittsburgh’s love and never-ending appetite for the dumplings plays a big part, too. “They give comfort,” he says. Pierogie-making has become his passion. He loves the challenge of coming up with the next winning flavor combination (to date, his only failure has been one filled with spaghetti) and also gets so much pleasure out of interacting with satisfied customers. “Nothing makes me happier than when an 80-year-old comes in here, and she comes back and tells me they taste just like Mom’s,” he says. The former ballroom is a family room and dining room at the Sewickley Heights “cottage” that was once part of the Franklin Farm estate. Post-Gazette photo. In the 1920s and ’30s, Pittsburgh’s captains of industry built lavish summer cottages high above the Ohio River to escape the city’s smoke and summertime heat. “Cottage” was something of a misnomer; their Sewickley Heights houses were every bit as opulent as the urban dwellings of these steel, shipping, manufacturing and banking barons and their families. The biggest differences were the size and setting: Separated by large tracts of woods and fields lined with massive stone walls, the palatial estates typically included gatehouses, greenhouses, servants quarters and stables. And sometimes, a playhouse. Franklin Farm on Blackburn Road was in a class by itself. 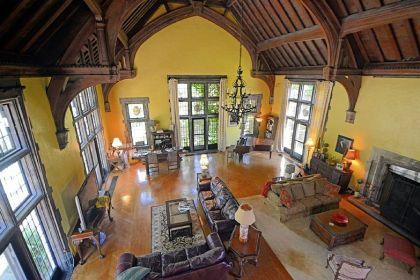 Built for steel tycoon B.F. Jones in 1899, it boasted more than 120 rooms under its Tudor-syle half-timbered gables and brick chimneys. Architects Rutan & Russell (who also designed the Edgeworth Club) created a house so large that it had its own 200-foot water tower fed by a woodland spring. In 1926, to celebrate their 24th wedding anniversary, Jones’ granddaughter Mary and her husband, William Christopher Robinson, added their own piece to Franklin Farms. 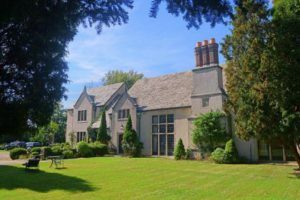 Mr. Robinson built his wife an elegant English Gothic playhouse that still stands today, long after the estate house it once adorned has vanished. 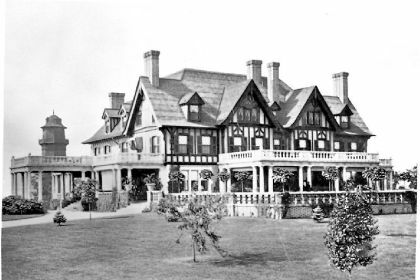 Too big and expensive for succeeding generations to maintain, Franklin Farm was demolished in the 1960s after pipes burst and the house was flooded. Only the water tower and playhouse remain, but what a grand piece of the Roaring ’20s it is. This English Gothic home built in 1926 at 845 Blackburn Road on the grounds of the Robinson estate is on the market for $2.7 million. Post-Gazette photo. Distinguished by a 100-by-40-foot ballroom with a 35-foot-high beamed ceiling and musicians’ gallery, the New Place, as it was called, was a jazzy offshoot of the main house in which the Robinsons entertained high-society friends and family. 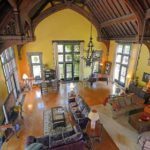 Architect Philip Hiss’ design includes a ceiling of delicate floral plasterwork, inlaid hardwood floors, wide Tudor arches and intricately carved crests — not the kind of place you’d want to drag mud in on your shoes from the outdoors. 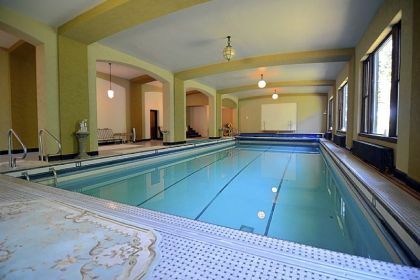 Unless, of course, you were headed to the basement, where guests could swim laps in a four-lane Olympic-sized swimming pool or hit balls in a full-size squash court. An outdoor pool was built in the front yard, not far from a large brick gazebo/teahouse that looked out on terraced gardens with ancient sycamore, oak and weeping beech trees. After the main house was torn down in 1963, the stucco playhouse was converted a few years later into a single-family residence by Williams-Trebilcock-Whitehead. It sits on a little more than 5 acres and is now on the market for $2.7 million. Of the two pools at the Sewickley Heights “playhouse,” only the indoor Olympic size one remains. Post-Gazette photo. “It truly was an entertainment center,” says its current owner, who asked that her name not be used. She says she is selling because she’s downsizing. Recently remodeled with a two-story kitchen/master suite addition, the two-story playhouse retains much of its Gatsby-esque magic. The outdoor swimming pool has long been filled in, but you still can walk two sets of wide stone steps that once led visitors to the main house and are now shaded by mature trees. The water tower also stands despite being hit by lightning and catching fire a decade ago. In 1978, Pittsburgh History & Landmarks Foundation named it a historic landmark. Reimagined as a great room, the ballroom remains the most breathtaking space in the house. Three walls are graced with four sets of original leaded- and stained-glass French doors — two leading to the front yard and two to a large piazza surrounded by an original wrought-iron rail. Grand but not overly so, this is where the Sewickley Hunt held its annual New Year’s Day breakfast for many years. Previous owners created a formal dining room by building walls under the original bandstand. At one point, the loft above was used as a bedroom; today, it’s a home office. The view of the living room below is nothing short of spectacular. With five bedrooms and 41/2 baths, the house is well suited for a family with children. But it also is the perfect home for entertaining. A 2010 addition, painted in pastels, offers a modern take on luxury. A 10-foot-long marble island in the kitchen separates the gourmet cooking area — outfitted with custom beech cabinets and a six-burner Viking range — from a large and comfortable family room. In the corner, a spiral staircase leads to a sunny and airy master bedroom suite brightened by skylights and outfitted with a walk-in closet and laundry. The master bath, originally two bathrooms, has a whirlpool tub and walk-in stone shower. Downstairs, the pool also has recently been renovated, and it includes a separate dressing room and full bath with original fixtures. Franklin Farm on Blackburn Road in Sewickley Heights was built by steel baron B.F. Jones of Jones & Laughlin Steel Corp. in 1899. Its landmark water tower appears on the left. The main house was torn down in the 1960s. Photo courtesy of Sewickley Valley Historical Society. The New Place comes with literary provenance: It was included in Marcia Davenport’s best-selling historical novel “Valley of Decision” (1942) about a young Irish housemaid who falls in love with the son of her employer, a local steel mill owner. The author probably wasn’t talking about Robinson, who made his fortune not in steel but in manufacturing. (He founded Robinson and Rea Manufacturing in 1891 and also National Medal Moulding Co., which later became National Electric Products Co.) But he certainly lived the opulent lifestyle depicted in the book. A bio in George T. Fleming’s “History of Pittsburgh and Environs” from 1920 noted Robinson had “little leisure for relaxation but gets out into the open occasionally, enjoying hunting, fishing, golf and tennis.” Yet old newspaper clippings suggest he enjoyed a good time as much as the next millionaire. Founding members of Allegheny Country Club, the Robinsons held scores of dinners and parties at the playhouse during the 1930s and ’40s, including one of Sewickley Heights’ biggest social events of the year: the famed annual Riding and Driving Party on the day before a large horse show at Allegheny Country Club in early June. As many as 700 people came to their home for dinner and dancing for the event, and guests — who arrived either in horse-drawn carriages or cars — often wore costumes. When I learned there would be a Dutch-oven cooking demonstration at this year’s Association of Food Journalists conference, held last week in this mountainside ski town that’s famous for hosting the Sundance Film Festival, my immediate thought was this: Big whoop. 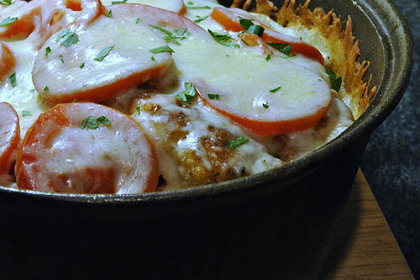 Who doesn’t know how to cook in a Dutch oven? 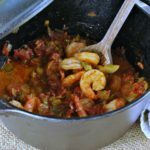 Like millions of Americans, I reach for my trusted enameled Dutch oven (I love my Le Creuset) anytime I want to whip up a hearty casserole, soup or stew. The bright-orange cast-iron pot also is my go-to vessel for the long, slow cooking of roasts and baked beans made from scratch. 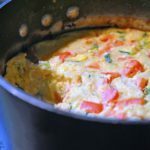 In my mind, it doesn’t get much easier than tossing all the ingredients for dinner into one big pot and then shoving in into the oven or, depending on the recipe, letting it bubble away on a burner. 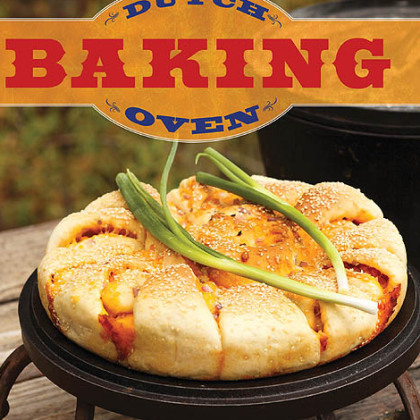 So imagine my surprise when I crawled into bed a few night before this past Friday’s marquee event with “Dutch Oven Baking” by Bruce Tracy, one of several new cookbooks devoted to Dutch-oven cooking that had recently come my way. I’d noticed the award-winning Mr. Tracy (he’s won dozens of Dutch-oven-cooking competitions, including the International Dutch Oven Society’s World Championship in 2004) was to be one of the presenters. Looking to be on top of my game, I figured it’d probably be a good idea to familiarize myself with its contents. Perusing a recipe for a awesome-looking apple-raisin upside-down cake, I noticed the list of ingredients called for something peculiar — six to seven coals on the bottom and 12 to 14 coals on top. “Why in the world would you put coals in the oven?” I asked my husband, whose response was to question my ability to read. I reached for the next cookbook in the stack, “Dutch Oven Cajun and Creole.” Same deal. Every recipe started with the number of coals on bottom and top. Unable to compute, I did what any normal American would do in those circumstances. I searched “Dutch oven cooking” on YouTube. Turns out, Dutch-oven cooking refers not just to the pot you’re preparing food in but a method of cooking that’s been around for centuries. It’s basically campfire cooking: All the ingredients go into a non-enameled cast-iron pot that is then heated by putting a certain number of hot coals under the pot and also on top of the tight-fitting lid. The amount and placement of the hot charcoal briquettes depends on what you’re cooking, as does the size of the oven. Shorter ovens spread heat to the center of the oven quicker than deeper ones, so they are good for cooking foods that need higher temperatures such as pies. (Yes, you can make a delicious fruit pie in a Dutch oven.) Taller ovens, conversely, are great for cooking foods at lower temperatures, such as roasts, hams or whole chickens, or where you want to control the amount of heat on top of the oven for even browning (rolls and bread). And don’t forget about the weather: You get less heat when it’s cold, cloudy or humid outside, and more when it’s hot and windy. Every cooking session, then, has to be fine-tuned. His basic rule of thumb is that one charcoal briquette, which should be gray at the edges, equals approximately 12 degrees of heat inside your Dutch oven. But you also can go by the “Rule of Three” for cooking at a standard 350 degrees: Double the size of the oven, and then put two-thirds of the coals on the lid and one-third underneath, just under the edge. For a 12-inch oven, that translates into eight coals on the bottom and 16 coals on top. The term “Dutch oven” is something of a misnomer in that the pots are neither Dutch nor actual ovens. Rather, it refers to the casting process developed in Holland by which brass vessels were cast in dry-sand molds. In 1704, an Englishman by the name of Abraham Darby traveled to the Netherlands to observe how the thick-walled cast-iron pots were made, and eventually patented a similar process for use in England and its American colonies. As food columnist Valerie Phillips explained at the Park City cooking demo, Dutch ovens played a big part in settling the American West. The cowboys, prospectors and miners (and their families) who migrated west to settle the new territories in the 18th and 19th centuries couldn’t very well take their home ovens with them on horseback or in chuck wagons, so they had to learn how to cook entire meals in a single pot over acampfire. One of the earliest written references to this specialized style of cooking was in a 1803 letter by Meriwether Lewis, who used the cast-iron pot during his famous expedition into the newly acquired Louisiana Purchase territory, that noted a “portable soup,” a type of dehydrated food made with meat boiled down to a concentrated gel. Paul Revere is credited with adding the three little legs on the pot that allow for a ring of coals underneath, and he also created the flanged, flat lid so hot coals also could be piled on top and not slide off. (Dutch ovens without legs are called “bean pots.”) Many also had “ears” on each side to allow for a steel bail handle for carrying and hanging. Varying sizes allowed them to be stacked one upon the other with coals between each layer. By the 1900s, Dutch oven cooking had fallen out of favor, as indoor stoves and ranges became more affordable and popular. But the pots — the best made by Erie-based Griswold, which during its heyday in the 1860s offered some 7,000 cast-iron products — remained popular with outdoor types who cooked on the coals of an open fire. Somehow they spread the gospel: In 1985, a group of “black pot” activists started the International Dutch Oven Society (idos.com) in Utah with the goal of preserving and promoting this very American way of cooking. 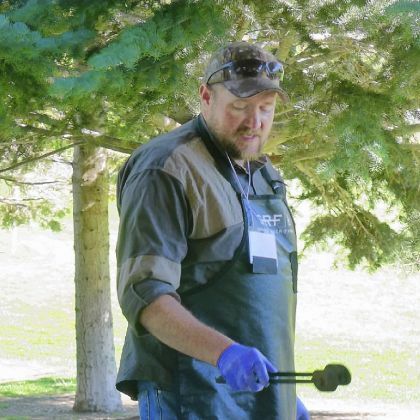 Today, there’s nearly 30 chapters across the U.S., including two in Pennsylvania — Valley Forge Black Pots (splatterdab.com) and Susquehanna Iron Masters (susquehannaironmasters.com). And you get to do it outside, in the fresh air and sunshine. There also are the health benefits of cooking with cast iron. Not only can you cook with less oil (a well-seasoned pan will be close to nonstick), Ms. Sloan pointed out, but also cooking with cast iron fortifies your food with iron. That, and it’s oh-so-easy once you get the hang of it. Mr. Pelton, who grew up in central Utah, started Dutch-oven cooking when he was just a boy. By the time he was 12, he was cooking dinner most nights for his parents, both of whom worked swing shifts, and five younger siblings. (Elk and deer meat were favorites.) It became such a part of his life that when he did a two-year mission for the Mormon church at age 19 in Boston, he packed a 10-inch Dutch oven in his suitcase. The tradition of starting ’em young continues. Mr. Pelton’s 13-year-old daughter, Megan, tested every single dish in his cookbook and even 7-year-old Braxton has mastered a few recipes, including one for ham-and-bean soup. It helps, of course, that his dad’s cookbook includes illustrations of where the coals should be placed on both top and bottom, in addition to how to convert them to conventional range-top and oven cooking. “And if you follow the recipe, you cannot mess up,” he said. Because there’s a definite learning curve, Mr. Pelton suggests starting with something easy, such as his recipes for Chicken Parmesan (at post-gazette.com/food) and Roasted Pork Shoulder, which he demonstrated in less than an hour. The last Griswold pieces rolled out of the factory in 1953. So unless you’re lucky to find an old piece at a flea market or thrift store, the preferred brand today is Lodge Manufacturing (lodgemfg.com), which opened its first foundry in Pittsburg, Tenn., in 1896. Our group’s experts also had only great things to say about newcomer Camp Chef (campchef.com), formed in 1990 to provide quality cookware to outdoorsmen. As far as charcoal, only one name was bandied about: Kingsford, because of its consistency. While it’s possible to cook directly on the ground, our experts advised using Dutch ovens with legs, especially if you’re a newbie. If you really want to go all out, Camp Chef offers a whole line of Dutch-oven accessories, including tables, disposable liners, infrared thermometers and oven domes that insulate from bad weather. • A chimney starter makes short work of heating coals (10 to 20 minutes, depending on wind conditions). Once the charcoal stops smoking — it will be gray at the edges — you’re good to go. • Be patient, and don’t remove the lid. It helps the Dutch oven operate like a pressure cooker. • Don’t overfill the pot. Always leave a “moisture barrier” of at least 1 to 2 inches on top. • If you’re burning food, the coals are positioned wrong. Be sure to line the edges and not the middle of the pan. • If the recipe calls for greasing the pan, use Pam. It’s “God’s gift to cast-iron” because it’s made with canola oil, which has a much higher flash point. • You’ll know your dish is done when you start to smell it. 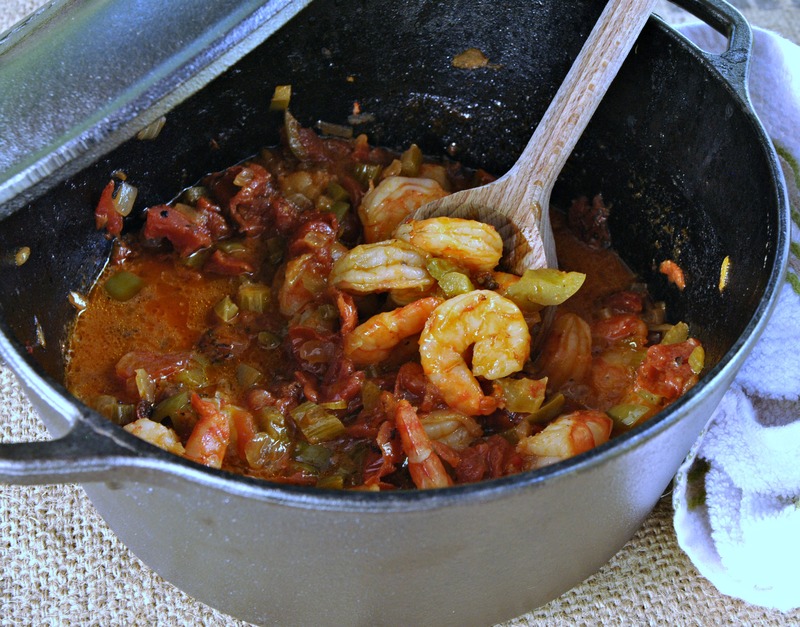 I cooked this simple shrimp dish on the stovetop in a Dutch oven. Next time, I’ll probably use uncooked shrimp because it’s extremely easy to overcook shellfish when you can’t see it turn pink — mine was a little rubbery (but still delicious). Saute onion, celery and pepper in butter in Dutch oven over a bed of coals or on a small camp stove for 15 minutes. Add tomatoes, brown sugar, bay leaves, salt and pepper; mix well. Cover and simmer, using 7 coals underneath the oven and 13 coals on top, for 30 minutes. Add lemon juice and shrimp. Simmer 6 to 10 minutes more or until shrimp are heated through. Discard bay leaves. This pie, made in a 10-inch Dutch oven, is an easy version of a quiche. Just pour the Bisquick batter over the top, and it makes its own crust during baking. It’s so quick and easy, I was able to throw it together after work and still have time to make it to a high school volleyball game. Grease Dutch oven. Put zucchini, tomatoes, onion and parmesan cheese in the oven. Beat the remaining ingredients for 1 minute; pour into pan over top of the other ingredients. Bake at 350 degrees until knife inserted in the center comes out clean, about 45 minutes. Cool 5 minutes and serve. To cook with coals in a Dutch oven, place 15 to 19 hot coals on top, in an evenly spaced ring around the rim of the lid, with 2 of those coals in the middle of the lid. On the bottom, place 10 to 12 coals in a ring around the outer edge of the pot. Yes, you can make a breads in a Dutch oven, and pretty good ones at that. But you may want to start slow with something easy like these white rolls. Relatively speaking, that is: While not an Epic Fail, my rolls didn’t look anything like the picture in the book — they baked almost to the top of the Dutch oven, and didn’t separate. (But they still tasted great.) Cookbook author Bruce Tracy told me it’s because I let the dough rise too long (hours instead of minutes) and neglected to roll the dough balls in butter. “This fat layer should keep your rolls separated,” he said. In a large bowl, combine water and honey. Add 1/2 cup melted butter, salt and eggs. Mix yeast with 1 cup flour and then add to wet ingredients. Mix thoroughly for about 30 seconds. Slowly add more flour, 1 cup at a time, until dough pulls away from the sides of the bowl. Add more flour if it is too sticky. Scoop dough with a small ice cream scoop, and form into tight 21/2-inch balls. Dip each ball into the remaining melted butter, and beginning in the middle, place each ball in Dutch oven that has been prepared with nonstick cooking spray. The balls should be just touching. Put the lid on and allow to rise approximately 30 minutes, or until double in size. Bake, using 8 coals underneath the oven and 16 coals on top, for about 25 minutes until the rolls are golden brown. (If using oven, bake at 350 degrees) When bread is done, remove the coals, (or remove from oven) brush the tops with melted butter, and sprinkle with a little kosher salt, if desired. Turn out onto the lid. Serve warm or at room temperature. This tastes so much fresher than chicken parm made with red sauce. To cut down on the cooking time in the oven (the kids, apparently, were “starving”), I pounded the chicken breasts extra thin. I thought an entire pound of mozzarella was too much; an 8-ounce package would suffice. 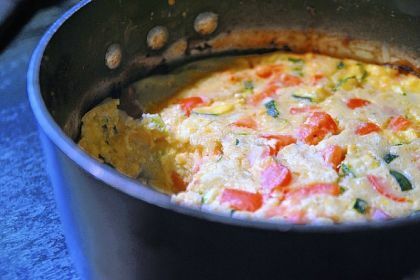 In a 12-inch Dutch oven, place olive oil, tomatoes, garlic, basil and oregano. Bake for 30 minutes. Add sugar, grape juice or wine, mushrooms and the cooked/fresh pasta. Stir it well and remove it from the heat. Trim any fat from chicken and pound the breasts to same thickness (I pounded them to 1/2-inch-thick). Dust meat in flour and set on plate. In a bowl, mix salt, pepper, eggs and a little milk to moisten, and whip until frothy. Dump bread crumbs on plate. 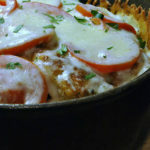 Dip breasts in eggs and then roll in bread crumbs; set on plate. Heat some oil in a skillet. Fry breasts 1 at a time until lightly golden on both sides. Pat dry with a paper towel. 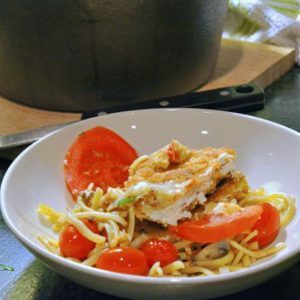 Set chicken on top of pasta and top with tomato slices, followed by some mozzarella cheese. Sprinkle the remaining mozzarella on the top of the whole dish. When chicken is done, remove pot from heat or oven. Let rest for 10 minutes before serving.